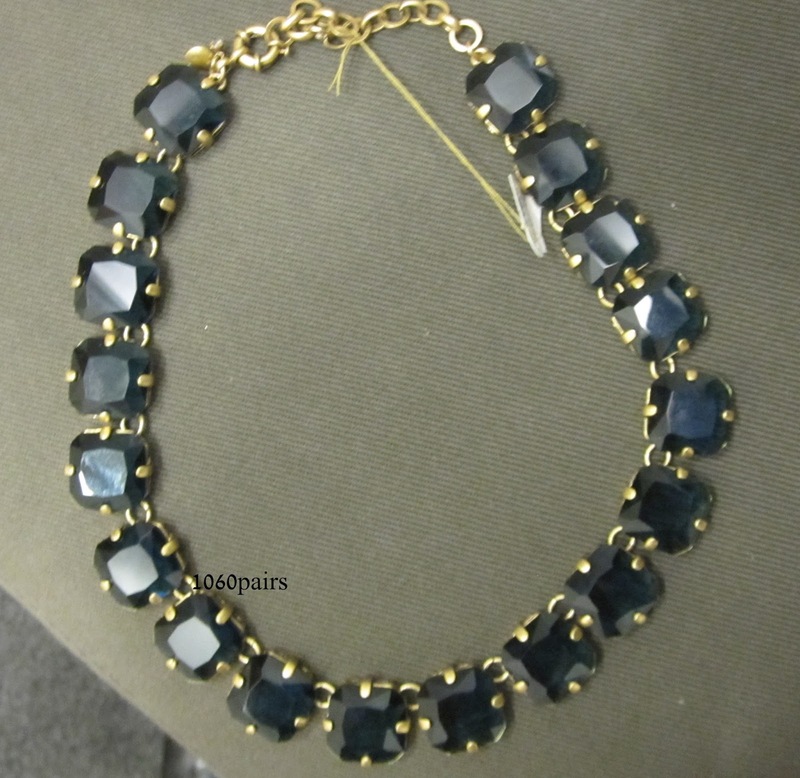 Octagon necklace (06429, $98) comes in beige stone & majestic blue. It’s currently on sale for $49.99 in-store. I bought the beige stone & it definitely rang up at that price, which is odd because the bracelet was marked $49.99 in two stores. I thought it would be marked cheaper than the necklace. I put this aside to buy and forgot to take a pic of it on me. It blends in a lot w/my skin like it does with the wood. It’s very pretty and not any color I already have. 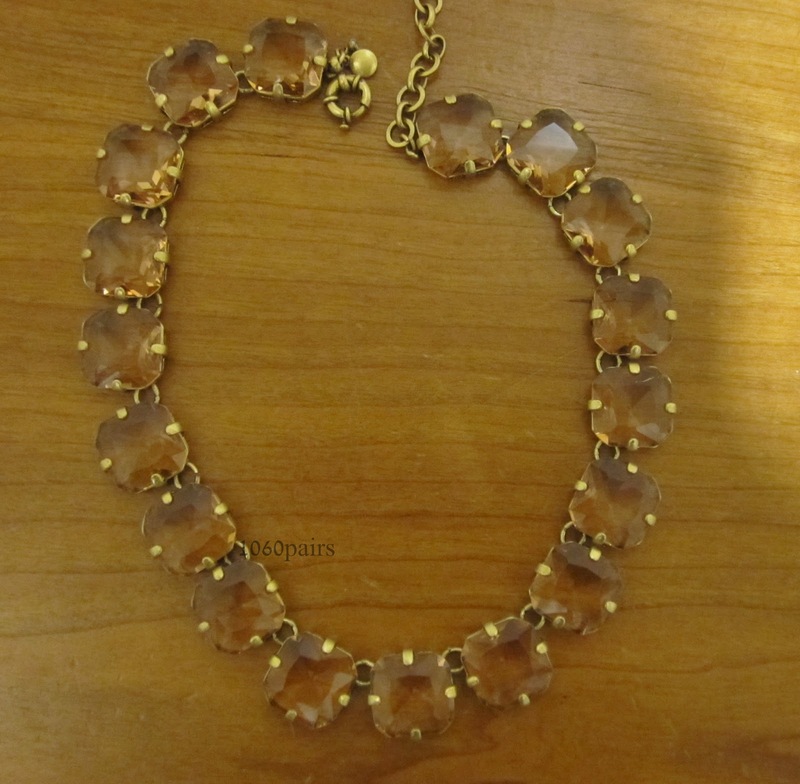 I have a lot of J Crew necklaces w/clear stones. It’s very pretty. The stone color is a bit see-thru, so it picks up the color of your skin. I think my skin made the stones look darker than when held up to the light. If you have white skin, it’s going to look different. It looked too dressy in color for my needs. 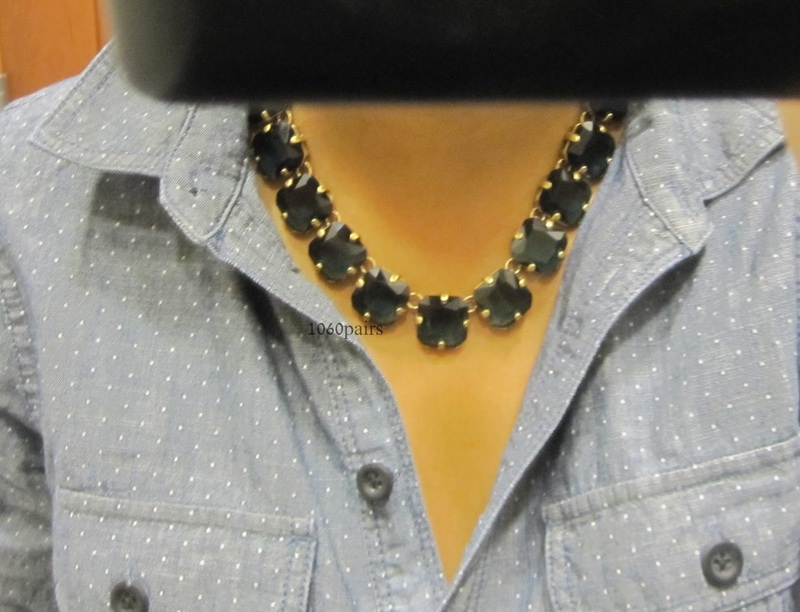 I tried, but couldn’t justify it as a stand-in for a black necklace. I stayed strong and passed even though I thought it was beautiful. 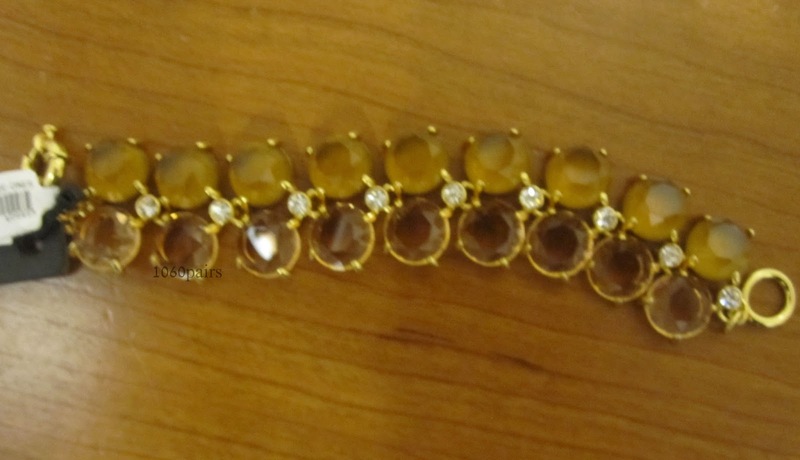 Octagon bracelet (06484, $65) also comes in beige stone & majestic blue. FALLSTYLE gets 25% off this bracelet and the necklace online thru Sun, 9/15. Both the braceet & necklace are $49.99 in-store, which I saw on 9/11. Very pretty. As nice as he necklace. Just didn’t need, so I passed. I couldn’t get past it being the same sale price as the necklace. If it had been $39.99, I would’ve gotten it. That only makes it a $7 difference after 30%, but hey, that’s the psychology of shopping. 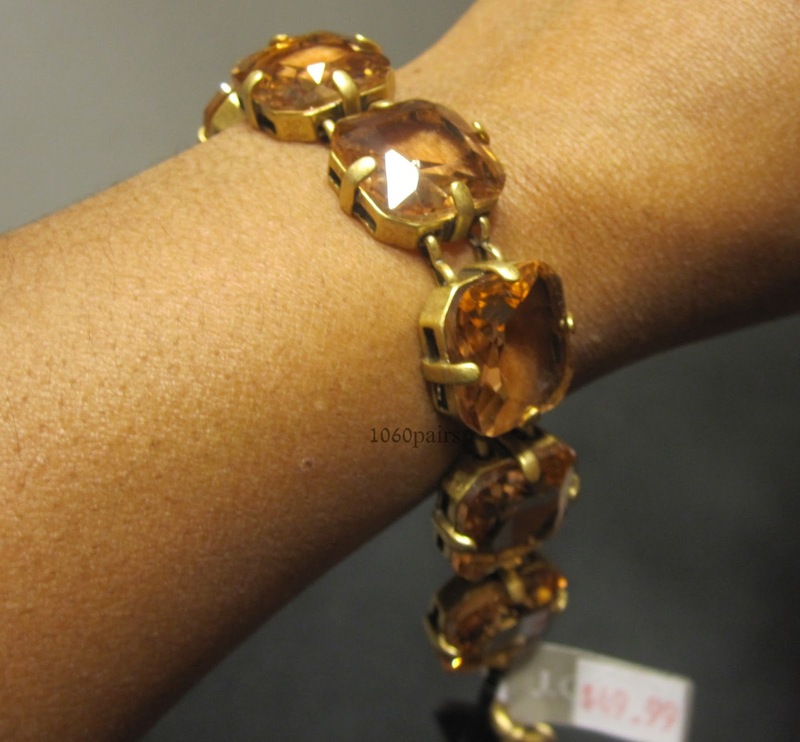 Stone rows bracelet (04415, $85) is currently $49.99 in-store & online. The color is called pale jasmine. It wasn’t for me, personally. 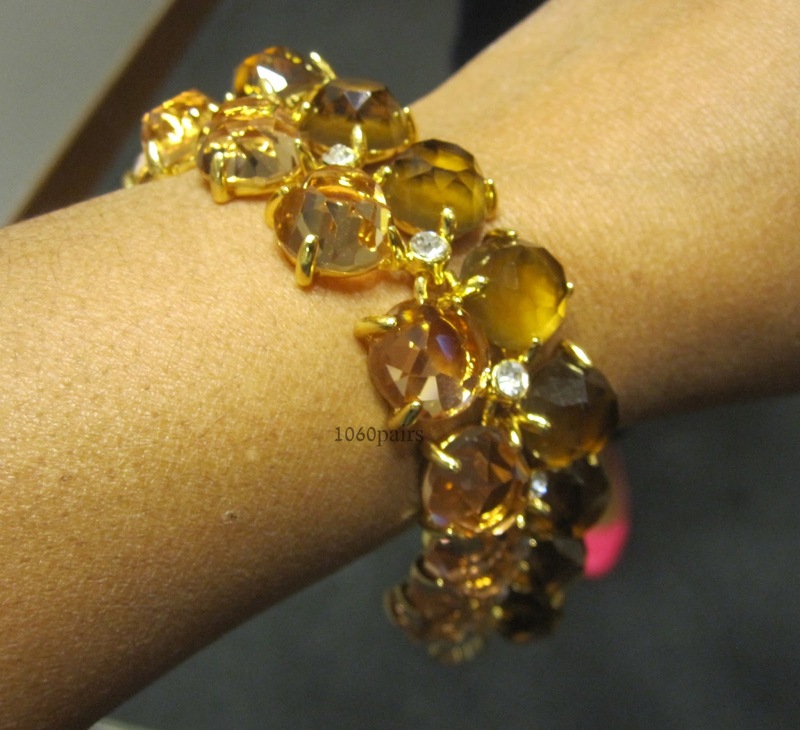 I do like the gold & amber tones as something different, but don’t have much in my wardrobe that would mix well. The two rows & the clear, mini crystals in between are cute. Use your Gilt City 25% off coupon thru Tue, 9/17. See the Guide. Thanks SO much for sharing these great pieces! I love that necklace on you!!! And, I love the Stone Rows Bracelet on you too. I snagged that bracelet to stack with other arm candy! I bet that necklace is so pretty on you Gigi! I need to get in store soon. Hello! I just would like to give a huge thumbs up for the great info you’ve got here on this post. I are going to be coming back to your weblog for extra soon. A person essentially help to make seriously articles I would state. This is the very first time I frequented your web page and thus far? I surprised with the research you made to create this particular publish amazing. Great job! I simply wanted to appreciate you all over again. I’m not certain the things that I could possibly have created without the type of basics contributed by you on such subject matter. It has been a real frustrating circumstance in my position, nevertheless being able to view the specialised manner you dealt with the issue took me to leap for joy. I’m thankful for your guidance and even trust you find out what a great job you have been providing educating others using your webblog. Most probably you haven’t got to know any of us. you are really a good webmaster. The site loading speed is incredible. It seems that you’re doing any unique trick. Moreover, The contents are masterwork. you’ve done a great job on this topic! I just want to tell you that I am beginner to blogging and definitely liked you’re blog. Likely I’m going to bookmark your blog post . You really come with very good posts. With thanks for revealing your web-site. I simply want to tell you that I’m all new to blogging and absolutely loved this web site. Likely I’m likely to bookmark your site . You absolutely have terrific stories. Thank you for sharing your web page. I just want to mention I am just very new to weblog and really loved your website. Likely I’m planning to bookmark your site . You amazingly come with fabulous articles. Thank you for sharing your web page. I simply want to mention I’m new to weblog and seriously liked this web-site. More than likely I’m likely to bookmark your blog post . You actually have exceptional stories. Bless you for sharing your website. I simply want to say I’m all new to blogs and seriously savored this web page. Almost certainly I’m going to bookmark your site . You amazingly have good articles and reviews. Thanks a bunch for sharing with us your website page. I simply want to mention I am new to blogging and site-building and seriously liked your blog. Almost certainly I’m going to bookmark your website . You definitely come with fantastic stories. With thanks for sharing with us your web site. I just want to tell you that I am very new to blogs and absolutely loved your web page. Likely I’m going to bookmark your website . You certainly have very good articles and reviews. Kudos for revealing your web-site. Thank you for your whole effort on this website. Kate delights in getting into research and it’s easy to understand why. Most of us learn all concerning the dynamic medium you deliver important solutions by means of your website and as well as recommend participation from website visitors on that idea plus our favorite girl is actually understanding a lot. Enjoy the remaining portion of the year. You are performing a useful job. I just want to say I am all new to weblog and actually liked your web blog. Almost certainly I’m likely to bookmark your blog post . You really come with perfect well written articles. Regards for sharing your blog. I just want to tell you that I am beginner to blogging and really loved you’re web-site. More than likely I’m want to bookmark your blog . You certainly have wonderful well written articles. Thank you for sharing your web site. I simply want to tell you that I am just very new to weblog and certainly enjoyed you’re page. More than likely I’m going to bookmark your website . You certainly come with excellent articles. Appreciate it for revealing your website page. I simply want to mention I’m new to blogging and site-building and truly loved you’re blog site. Almost certainly I’m likely to bookmark your website . You really have beneficial writings. Thanks a lot for sharing with us your webpage. wonderful publish, very informative. I’m wondering why the opposite experts of this sector do not realize this. You should continue your writing. I am confident, you’ve a great readers’ base already! F*ckin’ awesome things here. I’m very satisfied to peer your article. Thanks a lot and i am looking forward to touch you. Will you please drop me a mail? Needed to compose you this very little remark so as to give thanks over again for your nice techniques you have featured in this case. This has been simply shockingly open-handed of people like you to deliver unhampered what most people might have marketed for an e book to help make some profit on their own, principally given that you might well have done it in case you wanted. These points as well acted as the fantastic way to recognize that many people have similar keenness similar to my personal own to figure out very much more in regard to this issue. I know there are a lot more pleasant periods in the future for many who view your blog post. It¡¦s really a nice and helpful piece of info. I am satisfied that you shared this useful info with us. Please keep us up to date like this. Thanks for sharing. I truly love your website.. Very nice colors & theme. Did you make this site yourself? Please reply back as I’m attempting to create my very own website and would love to find out where you got this from or what the theme is called. Appreciate it! obviously like your web-site however you need to take a look at the spelling on quite a few of your posts. A number of them are rife with spelling problems and I find it very bothersome to inform the reality however I will surely come again again. There is definately a great deal to learn about this subject. I really like all of the points you’ve made. Spot on with this write-up, I seriously think this site needs far more attention. I’ll probably be back again to read through more, thanks for the info! obviously like your website but you need to check the spelling on quite a few of your posts. Several of them are rife with spelling problems and I to find it very bothersome to inform the truth then again I¡¦ll surely come again again. Someone necessarily lend a hand to make seriously posts I would state. That is the very first time I frequented your website page and thus far? I amazed with the research you made to create this actual post amazing. Excellent activity! There are actually a whole lot of particulars like that to take into consideration. That could be a great point to carry up. I provide the thoughts above as basic inspiration but clearly there are questions just like the one you bring up where crucial thing shall be working in trustworthy good faith. I don?t know if greatest practices have emerged round issues like that, but I’m positive that your job is clearly recognized as a good game. Both boys and girls really feel the impression of just a second’s pleasure, for the rest of their lives. I have been absent for some time, but now I remember why I used to love this blog. Thanks, I’ll try and check back more often. How frequently you update your site? I’m amazed, I must say. Rarely do I encounter a blog that’s equally educative and interesting, and let me tell you, you have hit the nail on the head. The problem is an issue that too few men and women are speaking intelligently about. Now i’m very happy that I stumbled across this during my search for something regarding this. You could certainly see your expertise in the paintings you write. The world hopes for more passionate writers like you who aren’t afraid to say how they believe. Always go after your heart. Whats Going down i am new to this, I stumbled upon this I have discovered It positively useful and it has aided me out loads. I hope to give a contribution & help other users like its helped me. Great job. Your style is so unique in comparison to other people I have read stuff from. Many thanks for posting when you’ve got the opportunity, Guess I’ll just bookmark this site. Thank you, I’ve just been searching for information about this topic for a long time and yours is the greatest I have found out till now. But, what concerning the bottom line? Are you sure about the source? Hello there, I found your site via Google while searching for a similar subject, your web site got here up, it seems to be good. I’ve bookmarked it in my google bookmarks. Hi there, I discovered your web site via Google even as looking for a similar subject, your website came up, it looks good. I’ve bookmarked it in my google bookmarks.